As readers of this blog know, I’m off to Munich later in the week to make several presentations at LeanKanban Central Europe 2015. I understand there is still room at my tutorial on the 18th that will cover the fundamentals of Boyd’s strategy, including roughly 100 pages from Patterns of Conflict and his other briefings. I have come under withering and totally underserved criticism from my legion of fans, well, from one of them, anyway, for not posting more regularly. I will take up that task anew upon my return. Boyd left Beauregard ST late in 1988. 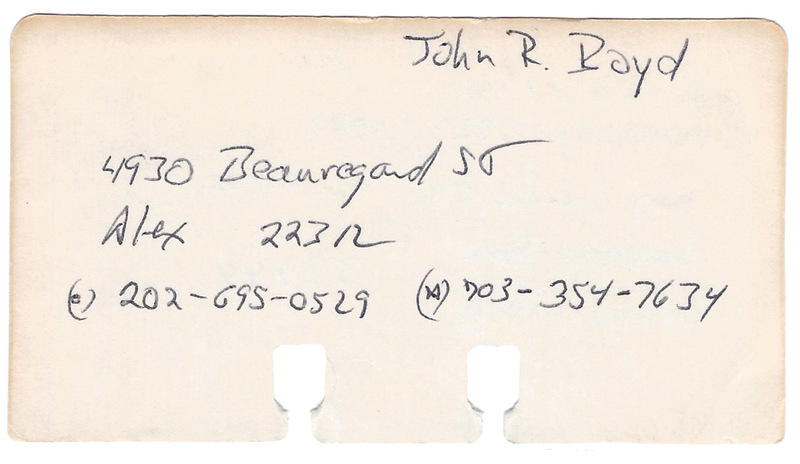 As best I recall, this card (called a “Rolodex card” for those of you under about 50) dates from around 1981, although it might be from as early as 1976. 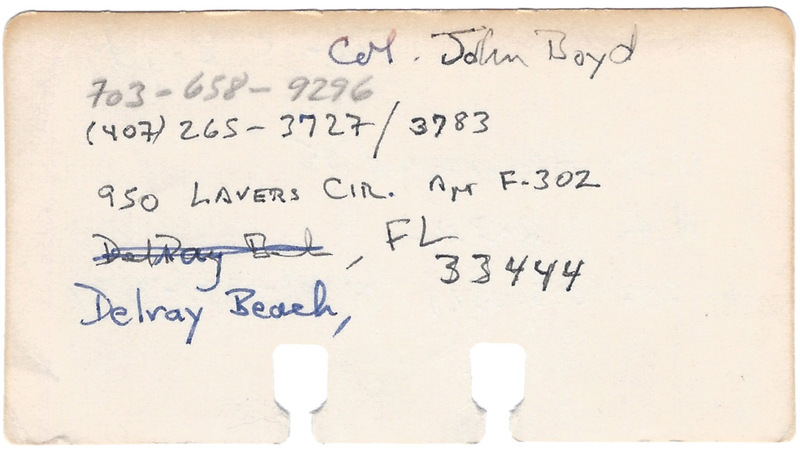 I believe that (202) 695-0529 was in the Tac Air shop, where Boyd worked as a consultant for Tom Christie after John’s retirement from the Air Force. A voice keeps insisting that my phone number, when I worked in the same office, was (202) 697-0521. ← Interview: What’s Boyd all about?